Address: Bozhou Road, the industrial park of zhongyun, Jiaozhou, Qingdao, China. PERT pipe machine designed by our company selected special extruder and adopted computer control. The screw has barrier unit and special material mixing components and barrel has new style grooves that achieve good plastication and mixing effect. The complete line assured great output and stable production. 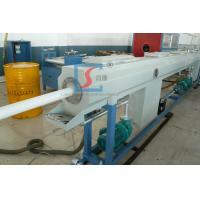 In addition, this line is equipped with special extruder for marking line of PE pipes. The extrusion line adopts the most advantaged spiral and lattice die head in the world, which assured stable extrusion in production process. In order to fit the performance of PE material and assure high production speed, we adopt water film lubricating and water circulation cooling. It has ellipse rectify device when producing huge diameter pipes. It has special designed vacuum and cooling devices that make good effect of huge diameter pipes extrusion.Haul-off machine adopts three and six pedrails with European speed control system makes hauling stable and reliable. Cutting adopts planetary saw. The complete line has a high computer automatically control degree and long life span without maintenance. Longchangjie designed and developed this line on the basis of many years’ experience. We can do diameter scope from 16mm to 1200mm, which widely used for water supply and gas distribution. planning, etc. so that customers make a reasonable plan with less cost. and auxiliary equipment and relevant budgeting, human resources allocation and budgeting. layout, workshop ventilation, water transmission etc. • We can provide free technical guidance if customers need new equipment, add or rebuild equipment.